First, create a final grade without the Extra Credit. Feel free to use the Re-normalize function under “Grading Setup”. 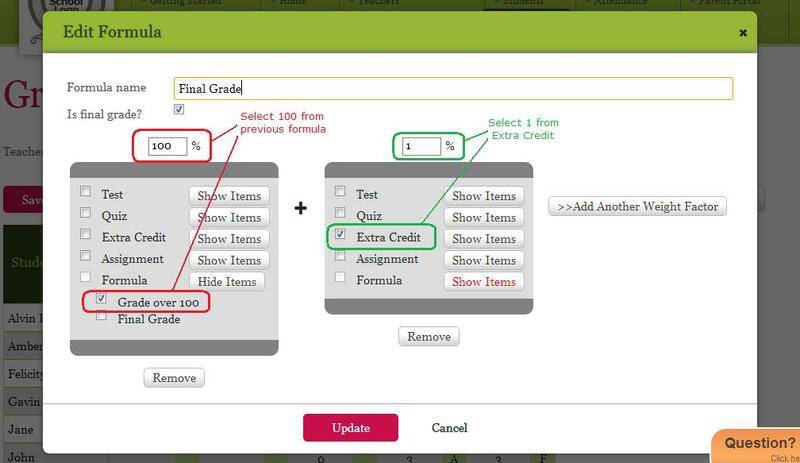 This will calculate a grade for all students, even if there are missing/empty categories in the calculation. Be sure to uncheck the “Is final grade?” check box, as this is technically not the final grade since it does not include extra credit. Next, create a column called “Extra Credit” and give it a total marks of 1. Fill this column as necessary. Finally, create a second formula that takes 100% from the previously calculated final grade, and adds 1% for the Extra Credit. This is what your final Gradebook should look like with the extra credit and 2 formulas. Notice only ONE column is designated “(Final Grade)” (as opposed to “(Formula)”). 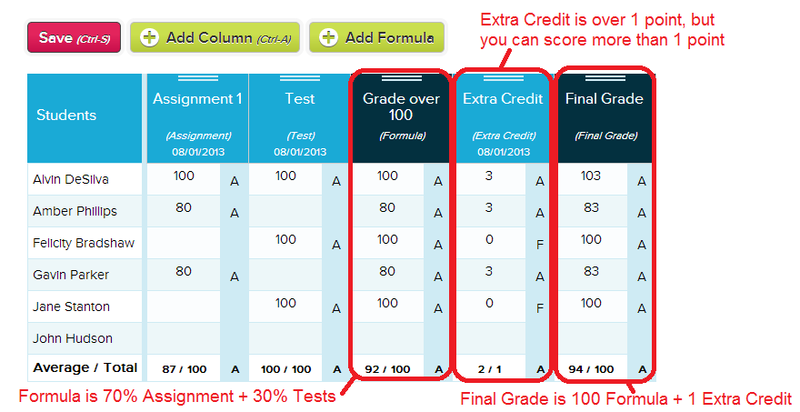 If the “Extra Credit” category is not available to you, you’ll need your school administrator to create it for you. Also, if your gradebook shows an “I” for incomplete, you’ll either need to explicitly assign a zero for Extra Credit, or, you’ll need to get your administrator to turn on Gradebook Normalization for missing categories. If you need help with this, just come chat with us. Hi, this is great if your extra credit is meant as an overall percentage addition. We typically give extra credit on a per assignment basis, so it is as simple as adding the extra credit into the assignment grade itself. That’s right. When you create an assignment column that is say, over 20 points, you could give the student 23/20, which is really 3 extra points above the allowable maximum. And this number will be figured into the overall final grade calculation for the student/subject.